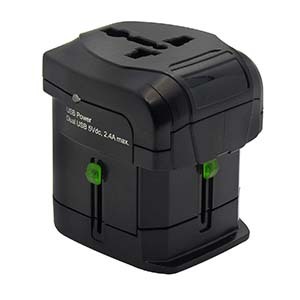 This compact travel adapter allows you to plug in any device to any wall socket by adapting to any two and three-bladed power plugs from the US, UK, EU, Australia, and China. 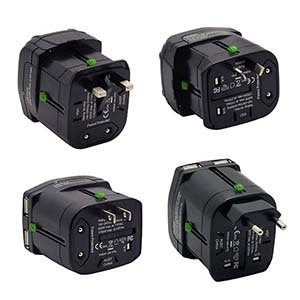 It converts wall sockets to the connection that you need, making it perfect for traveling. It also includes 2 USB ports so you can charge your cellphones or tablets anywhere on the go. 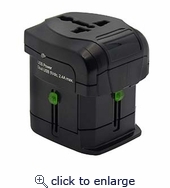 This adapter does NOT convert voltage through its AC Socket. It is not suitable for Hair Dryers, Flattening Iron's, or appliances that require earth connection. Unplug adapter when not in use.